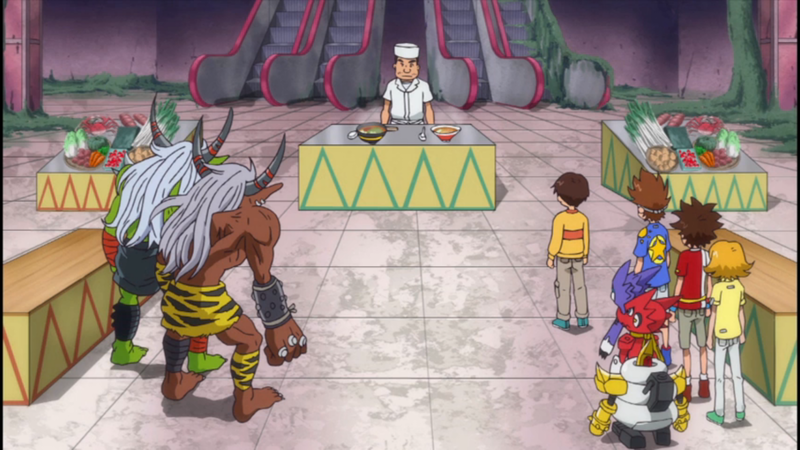 Digimon: System Restore: Xros Wars Episode 66: Delicious? Disgusting? The Digimon Ramen Face-off! Xros Wars Episode 66: Delicious? Disgusting? The Digimon Ramen Face-off! In this episode, sometimes the only way to resolve a dispute between working to make people happy and working for glory is through a cooking reality show. We're not quite halfway through Hunters and there is still no light at the end of the tunnel. As bad as we've had it before, there's been at least something resembling redemption up until this point. Sometimes the episode introduces a concept or gives us a fuller picture of one of the new characters. Sometimes it's a visit from Akari or Nene (or the way he's written sometimes, getting to see something from Yuu is generally pleasant). Even pure filler episodes give us more insight into a character, although we may not always like what we see when it's Tagiru. When the main problem is with some other kid, there's somehow a parallel that we can appreciate. Then we have episodes like these. Not only does the main conflict not involve Tagiru, Taiki or Yuu, but when you get down to it... they don't really do much of anything to resolve it. Oh, Tagiru's insatiable hunger and Taiki's refusal to let anybody have problems contribute to them wanting to resolve it. And Tagiru and Yuu compete to come up with a plan to save the ramen shop. And they discover the actual problem and explain it to Masaru. But when it comes to actually getting his father back? 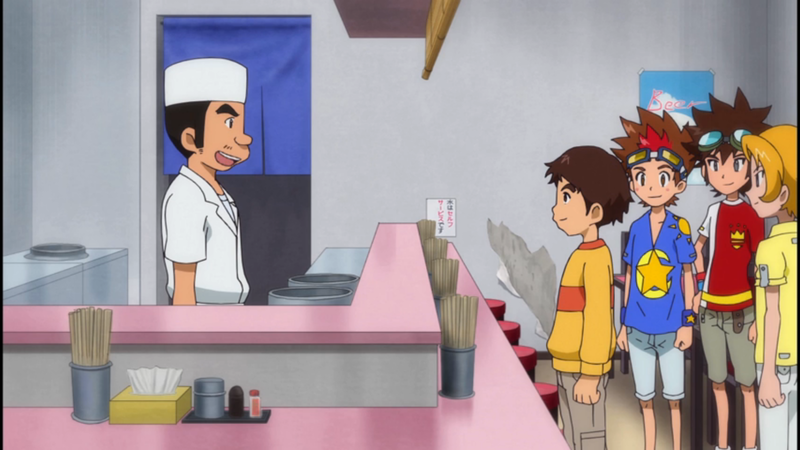 His name's Masaru: kid's got this. With Tagiru not doing anything to grossly offend Yuu this episode, we'll have to be disappointed that Masaru isn't punching anything instead. The conflict that the young hunters fail to fix combines the two basic premises of most of these filler episodes: Digimon are achieving their ends through humans and humans being too obsessed with their goals to avoid being corrupted. This means there isn't any new ground to cover. 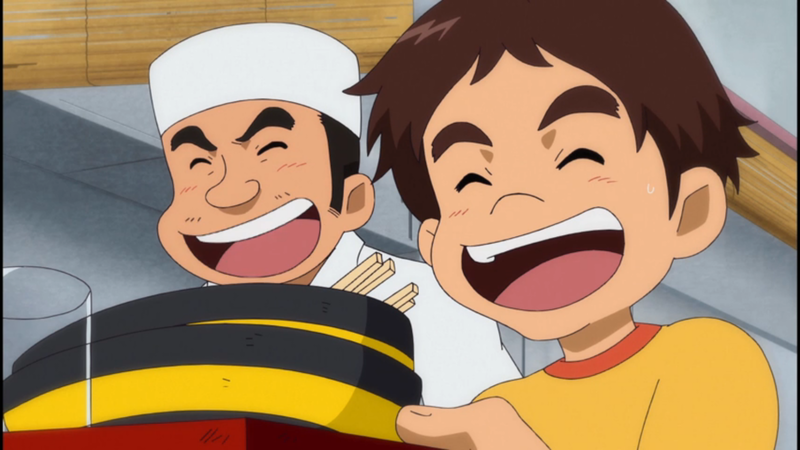 While Ogremon and Fugamon legitimately want to make delicious ramen, as does Suguru (in the interest of not having to say “Masaru's dad” all the time, we're calling him Suguru), their combination gets sinister in a hurry. Suguru's soup combined with Red and Green's peppers draws crowds from both worlds, which goes to their heads in a hurry. The thing about making delicious ramen is that people actually need to taste it, and the increasing throngs make it easier to brush off those who dislike the added spice. This upsets Masaru, who doesn't like the increased focus on popularity and the way Dad treats the sissies. There's also the whole issue of Suguru doing double duty and wearing himself out. Sure, Tagiru, Taiki and Yuu get into Digiquartz and discover the problem, but this face-off is all Masaru's idea. The actual contribution from the hunters and their Digimon is minimal at best. The face-off isn't even necessary, and actually contradicts the point Masaru is trying to make. He's trying to convince his father that while the noodles make the ramen better, the spiciness turns some people away and goes against the kind of wholesome “friendly” food they're going for. Why the hell would you argue for simplicity and openness through a big showy cook-off? The giant mall atrium in Digiquartz becomes Kitchen Stadium and the competition is the opposite of wholesome and friendly. It's also the second time since we've started Xros Wars where we've made a Kitchen Stadium reference, which is twice too many. Really, make the damn ramen with the damn clams and make your damn dad eat it and realize where he lost the damn path. There's no need for the big showdown, which meant there was no need to even have Arresterdramon in this episode. Sure Ogremon and Fugamon would get angry, but they went down with minimal coordination between the trio. It's such a simple resolution to a simple problem. It wasn't even something we needed to see at all. We should think Taiki can take care of these crises in his sleep. Tagiru's afterschool plans involve either playing with Gumdramon or hunting. This is literally the only thing going on in his life, while it's clear that Taiki and Yuu have other hobbies. It's a pretty nice touch that while Tagiru and Taiki enjoy Suguru's crappy noodles, Yuu's the only one who recognizes they're subpar. Because he has actual goddamn standards. There's a serious problem if random bystanders can hear Gumdramon shouting from inside his Xros Loader. Masaru telling his dad to judge was a simultaneously ballsy move and proof that the face-off was pointless. Him giving Tagiru, Taiki and Yuu the most basic of cooking tasks is simultaneously proof of how little the main characters actually did and totally awesome. The climactic battle is short and totally dull. It feels like Damemon's special orders were thrown in just to give it some sort of kick, although a standard digixros or evolution would have done the trick too. Given how tame Ogremon and Fugamon are after their capture, you wonder if fighting them was necessary at all or if an hour of cooldown time would have been enough to get them to behave. 01 Ogremon is seared into my brain so much that it's weird seeing Ogremon in other continuities and situations like this. Particularly egregious is that neither Ogremon nor Fugamon actually did any harm in this episode. Sure, they flipped out when they tried to take Suguru back, but honestly all they wanted to do is to sell those ramen. They aren't even abusive to Suguru, treating the dude with respect, unlike the other digimon feeding off people's emotions earlier in this show. And what did they get for trying to make a decent living? Captured and trapped for the rest of their life within Tagiru's Xros Loader.